If I were to get another tattoo (yes…I said “another”–don’t ask), I’m convinced I would get a tattoo of a compass. To serve as a visual reminder to never lose your way in life. It would have to be somewhere I could see it every day, so my backside wouldn’t work (ha!). Maybe an ankle? 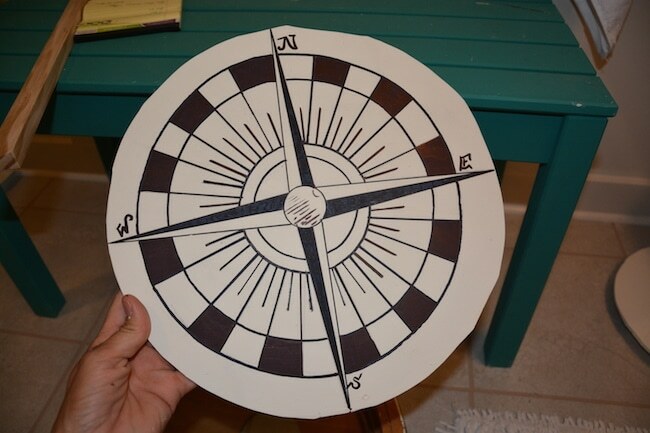 So I guess DIY compass wall art is going to have to suffice. I have no idea where my love of dials came from. I just know that it’s sort of a new interest in the last 6-8 months. 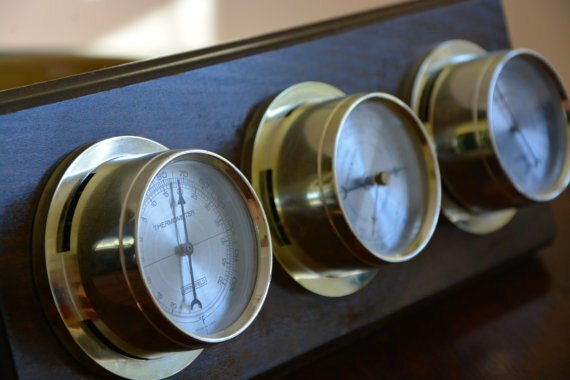 I started finding vintage weather stations at the thrift store (like this one I had bought). And they were too interesting to pass them up! 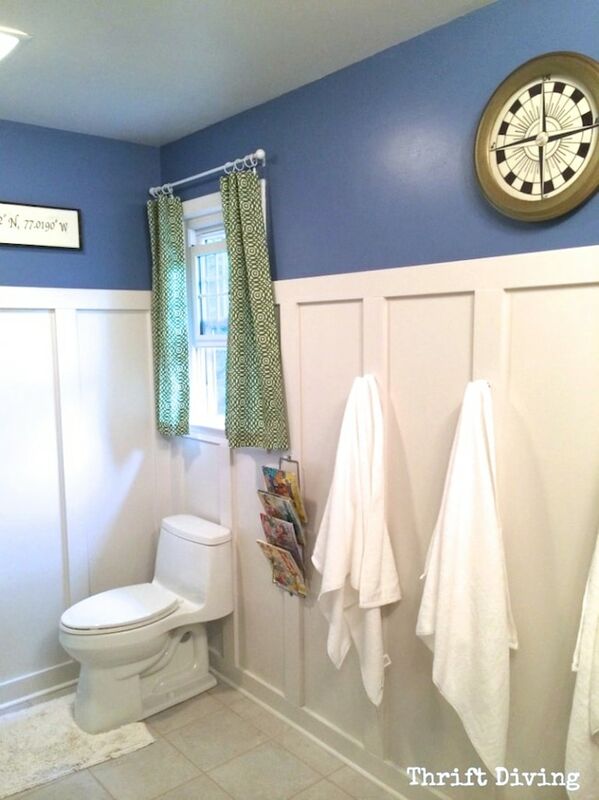 And when I did my kids’ bathroom makeover recently, my love of dials (and directions) played a huge role in me choosing a navigation theme bathroom for them. Late one night I got the idea to make a compass, but I wasn’t sure how I was going to execute it. Stencil it? Or make one to hang? This thing I found at the thrift store last year!!! It turned out pretty cute, so I thought I would share with you how I did it. 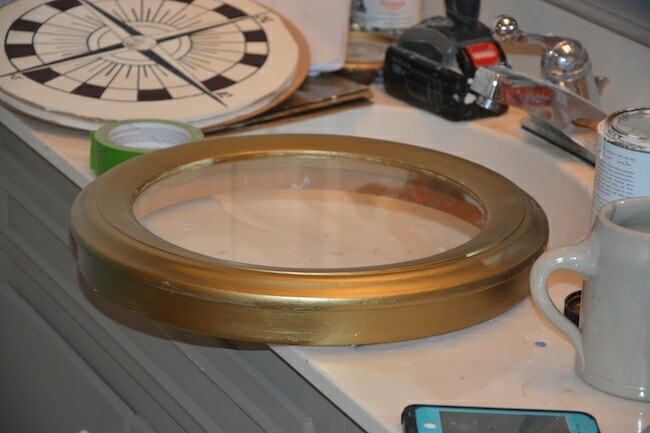 STEP 1: Go snag an old clock! 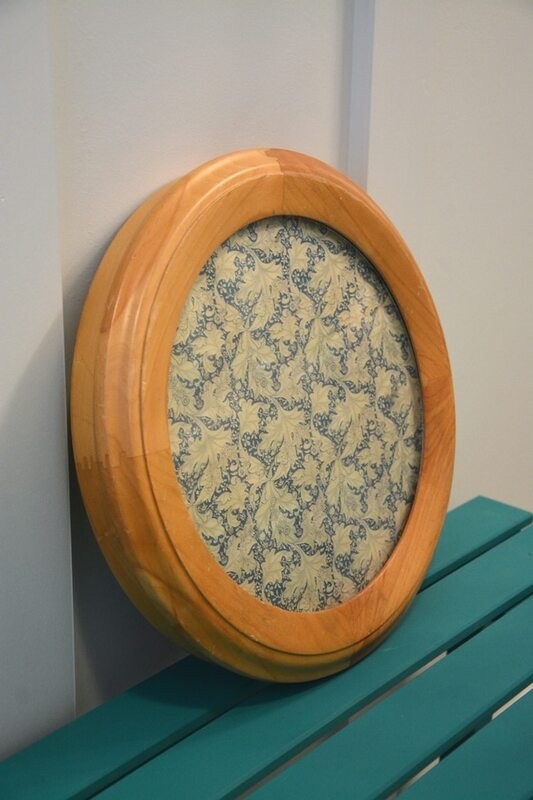 I didn’t know this wooden round thing from the thrift store was a clock. It was just $5.00, and I knew I could get creative with it in some way. 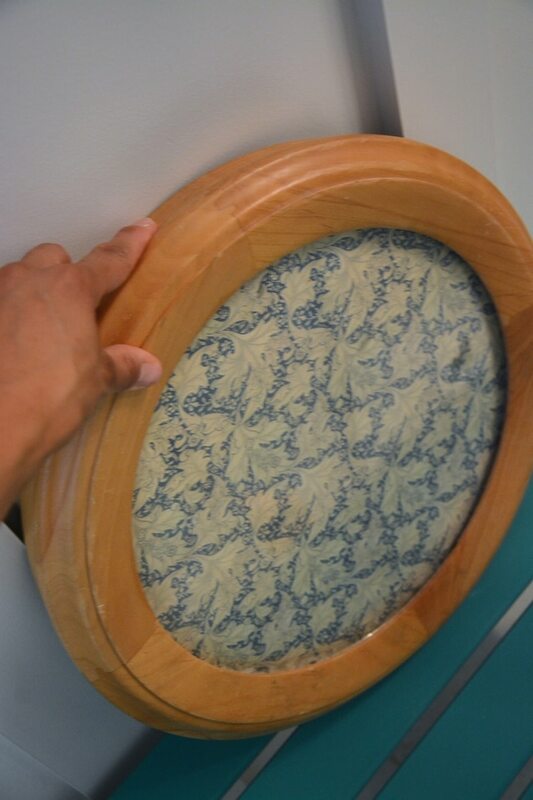 Once I removed the back, I discovered it was a clock. 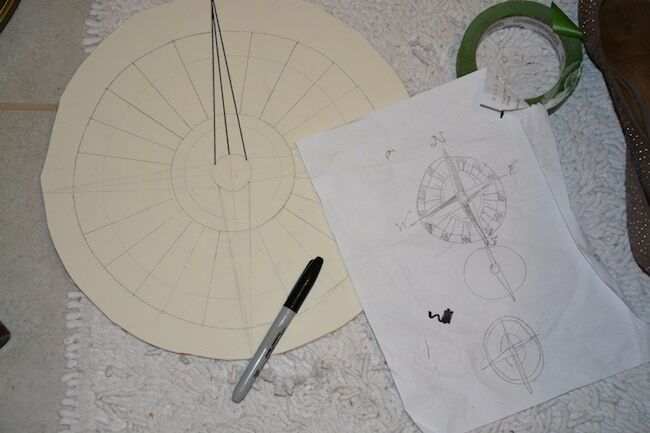 The shape and size was perfect for a large compass wall art piece. (This would be especially cool if you were even doing a kid’s bedroom or a navigation theme for a party!). STEP 2: Get ‘ta Cutting! 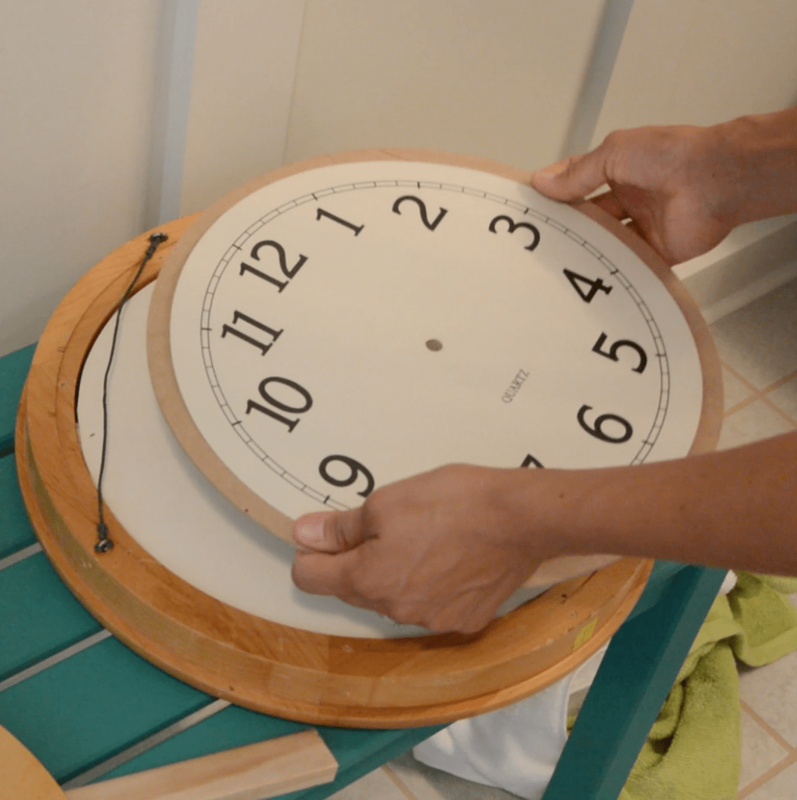 You’re going to need a round circle that’s thick enough to insert in the clock face. 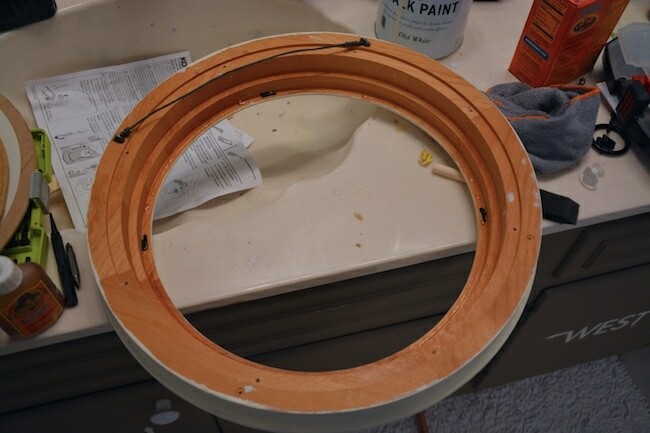 I used a 1/4″ MDF board that I had found next to the trash years ago on the side of the road! (And to think hubby actually scolded me for stopping to pick up that board…..The nerve!! LOL). 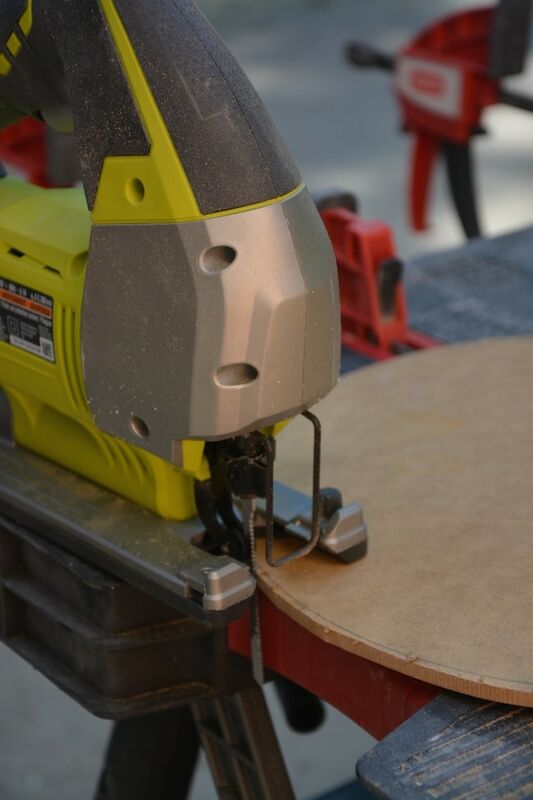 If you have a jigsaw (like this Ryobi one), then you can use that to cut your wood. 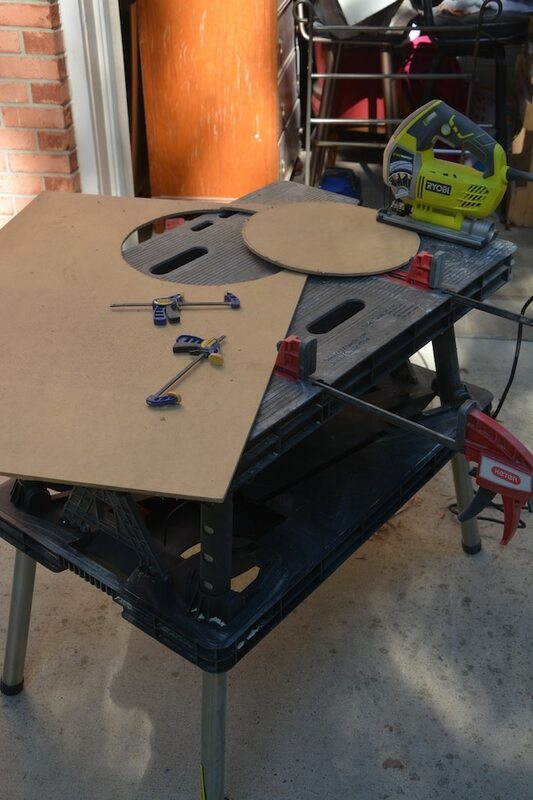 But you can also use foam board, or even painted cardboard. Really, anything will work! I used the glass insert as a template. STEP 3: Unleash Your Inner Picasso! Okay, so you don’t have to be Picasso. But you do need a ruler. Or better yet, a compass for drawing straight circles. I just laid down round objects and traced around them with a pencil, then outlined in black marker. You’re better off buying one of those school-compasses for making round circles, though. Much easier! I found a good video tutorial on YouTube on how to draw a compass design. It was spot on, and easy to follow! 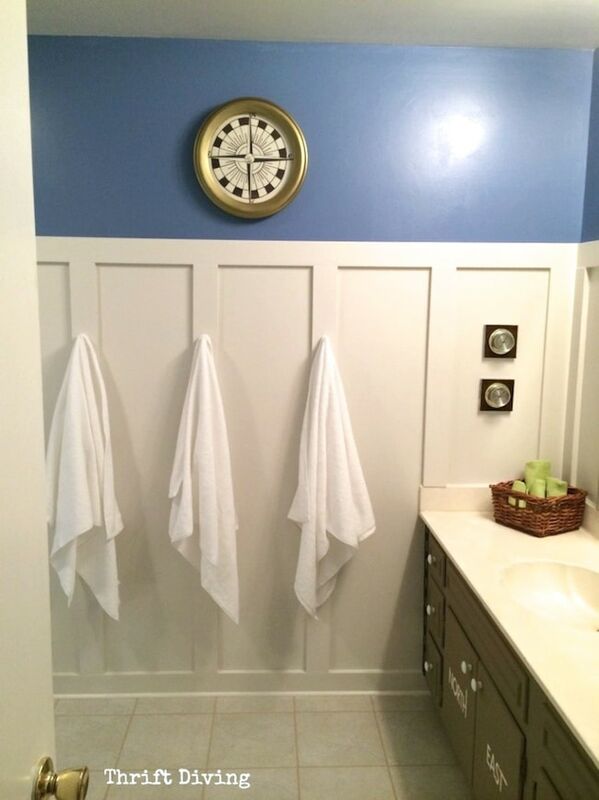 After I had cut out the wood piece, I painted it Old White using Annie Sloan chalk paint. 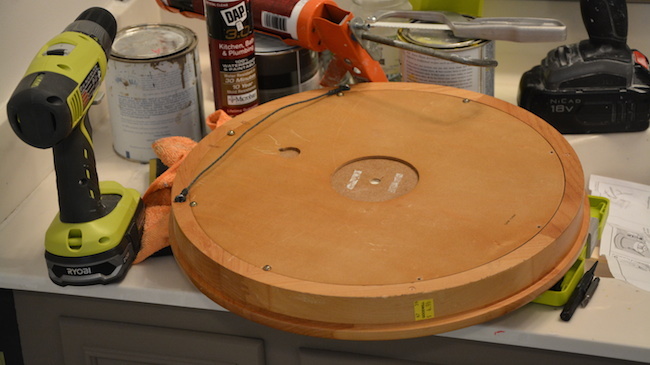 Then I used the instructions above to draw the compass on the painted wood circle. (I did a practice one first!). STEP 4: Go for the Gold! This is a crappy pic to show because it’s a bit spotty, but basically, I painted the wooden clock a gold metallic color. 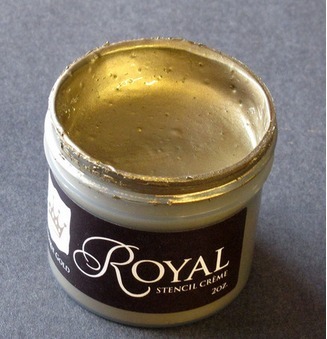 This is the Royal Design Studio stencil creme I used, in “Gold.” At first I was going to paint the wood white, but um…..have you ever seen a white compass? 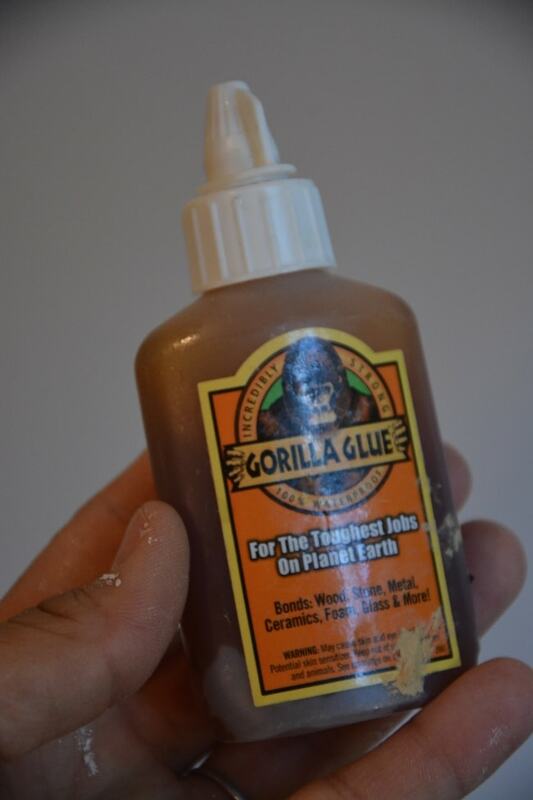 Be sure you don’t over-glue. 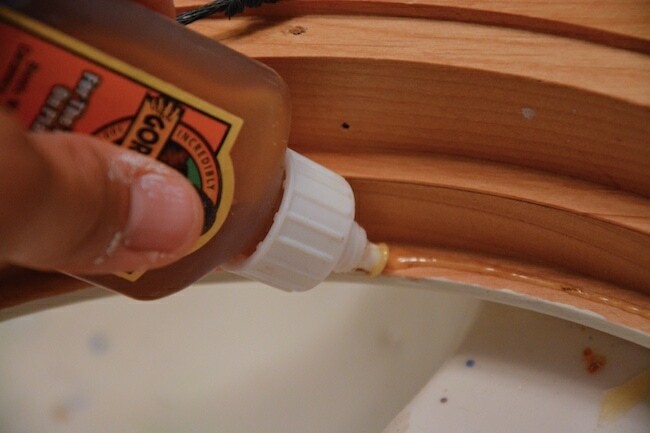 This is the step where, if you’ve got a glass insert, you may want to glue it to the wood. 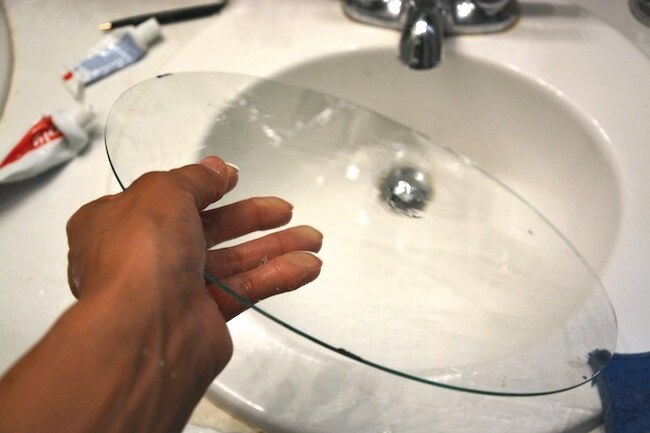 Now that there is glue along the rim, you can secure the glass if it’s shaky or wobbly inside your clock. This step is really optional, because you may not have glass, or it may already be secure. 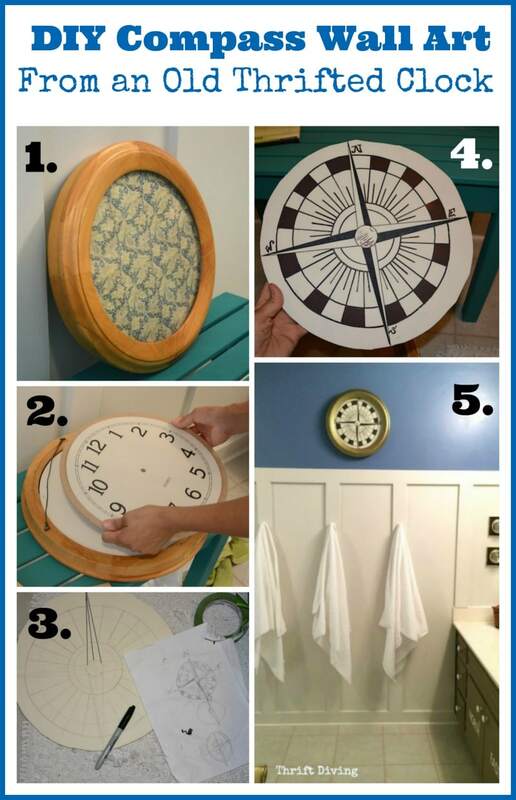 STEP 6: Admire Your New DIY Compass Wall Art! CLICK PIC TO PIN IT! You are so talented! And so pretty too. I can tell you are artsy just by your picture! Great job, Serena, you are a artist. I am so glad to have you back! Missed ya! And I am so digging the compass! Great job!! It feels good to be back, Cheri! I tried posting while I was there but posting from an iPad is nearly impossible! LOL All the bugs and kinks. Thanks for the comment! Wow! It is amazing! Love it! Awww….thanks, Diana! I really appreciate it. 🙂 Glad to have you as a reader!! !